In October 1912 the noted architect William F. Butler of St. John's designed what became the largest wooden Catholic church in Newfoundland, Our Lady of Mercy Church in Port-au-Port. Two years later construction began on the church, which today has a seating capacity of 1,000. Residents expected every able-bodied man and youth old enough to work to donate one week of work per year to the project. The church is situated on a narrow isthmus separating St. Georges and Port-au-Port bays. The impetus for construction was the opening of a limestone quarry in Aguathuna by the Dominion Iron and Steel Company. The company helped fund some of the work and provided machinery and free labour. The work was not completed until 1925, but the 11 year construction period allowed the massive church to be completed debt-free. The church was built to serve the Catholic population on the eastern end of the Port-aux-Port Peninsula. When the Aguathuna quarry opened, local residents expected the area to develop into a major centre. Although the new industry employed 500 people at its peak, the expected population boom did not occur. Our Lady of Mercy currently has a parish of approximately 1,200 people. 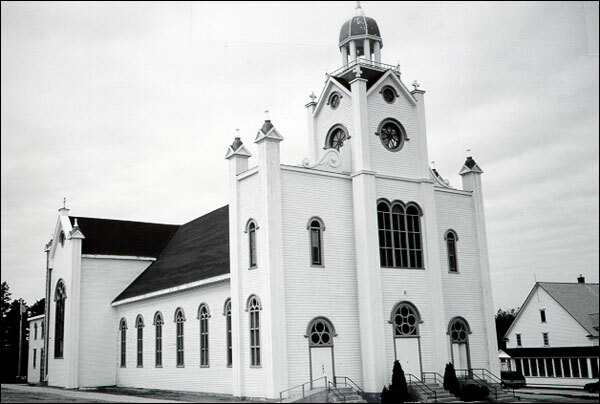 The church was built under the guidance of Father James Joy, the first resident priest on the Port-au-Port Peninsula. He was minister from 1900 until 1933. In addition to his efforts in constructing Our Lady of Mercy, he was known as a social reformer and leader. Joy became involved in a dispute in 1904 that eventually led to a repealing of a convention in existence since the Treaty of Utrecht in 1713 which had denied Newfoundland full sovereignty over the west coast of the island. Rev. Joy was also given credit for starting a Newfoundland smelt trade with the United States in 1918. The largest wooden Catholic church in Newfoundland, it is an imposing example of a Renaissance Revival structure. An impressive structure, the church is situated on a narrow isthmus separating St. Georges and Port-au-Port bays, and stands 35 m. (115 ft.) tall. Our Lady of Mercy's spectacular exterior is matched by its interior. The ornate interior is a result of local craftsmanship, gifts to the church and imported religious paraphernalia. The parishioners imported the wood for the interior from mainland Canada, with the ornate designs being completed by local craftsmen. The same craftsmen also made the pews. Residents, at the time of construction and in subsequent years, donated many statues to the church. In addition, St. Patrick's church in St. John's donated the decorative pulpit in 1925. 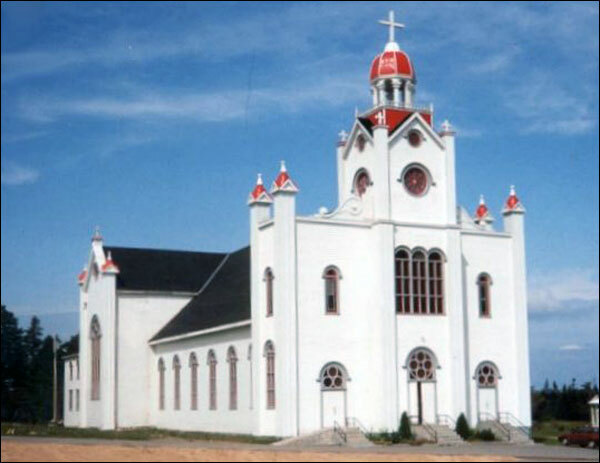 The spectacular Our Lady of Mercy Church was made a Registered Heritage Structure by the Heritage Foundation of Newfoundland and Labrador in May 1997. Also view Our Lady of Mercy Roman Catholic Church Registered Heritage Structure on the Heritage Foundation of Newfoundland and Labrador web site. The Newfoundland and Labrador Heritage Web Site has on its site only a portion of the registered heritage structures in Newfoundland and Labrador. To view a complete list or search for a particular structure visit the Heritage Foundation's Property Search page.